It’s that time of the month again where we get potentially big volatility for Sterling pairs thanks to a double whammy of major catalysts: MPC meeting minutes and the U.K. unemployment data. The MPC meeting minutes gives us an insight to how the Bank of England comes to their decision on interest rates and asset purchases. As I mentioned yesterday in my central bank preview, no changes were made to monetary policy in the last meeting despite the trend of improving economic data relative to its peers. BOE Governor Carney and crew continues to take the stance that they are seeing a recovery and do not want to do anything to jeopardize that, so expectations are for another unanimous vote to hold. The unemployment data for the U.K. is released at the same time, with expectations of a slight rise in claims and the unemployment rate to come in again at 7.2%. More often than not, the net claims number beats expectations, but in the last release, we saw a surprise tick higher in the unemployment rate. It’s always a near impossible feat to try to determine what the actual data will be or what policy makers may or may not have said during their meetings, but one thing we can take away from these charts is that there is a general behavioral tendency before and after major events like these: consolidation and then break out. 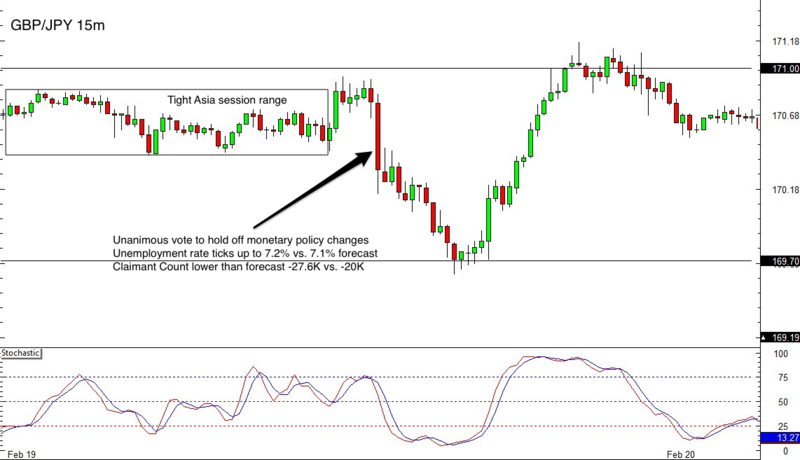 If market volatility drops during the Asia session, it may be a good idea to plot the Asia session highs and lows as a framework to enter the market when volatility spikes higher. 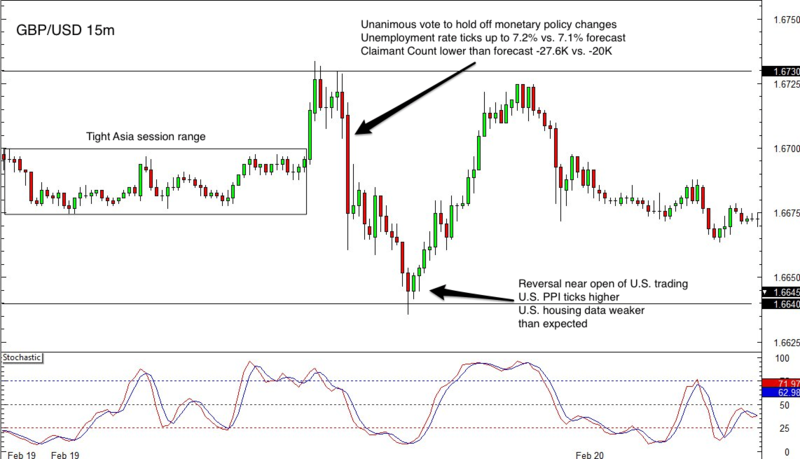 And similar to our observation of January’s price action, momentum may slow down when the U.S. opens up for trading. Besides these behavioral tendencies to consider ahead of tomorrow’s events, also remember that entering around fast markets can lead to slippage. So it’s probably a good idea to get the data first, see if there are any big surprises, and then make a decision on how you want to trade. 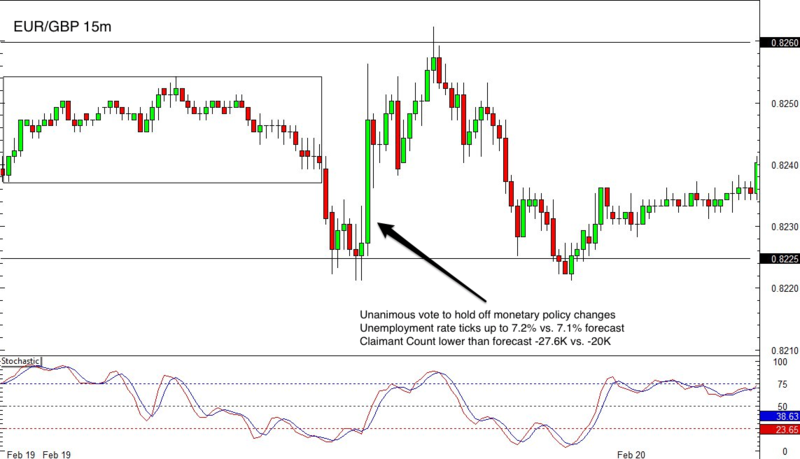 Depending on the data, you may or may not hit a home run, but you can still potentially catch a few pips safely.